Our website relies on cookies to provide the best possible user experience, understand our customers, and make improvements. Disabling cookies may reduce performance and cause some features to function incorrectly. Our floorless series complete sewn in sod flaps in the traditional bell tent style. Made with our Classc Canvas. Perfect for reenactments or pitched on custom platforms. The traditional floorless Sibley is perfect for my custom platform! Our Classic Canvas bell tent series with a sewn in waterproof groundsheet and fixed side walls. No one makes a better bell tent than CanvasCamp! Zip in/out groundsheet, mesh doors and roll up side walls: The Ultimate is our feature-packed bell tent series for weekend warriors. Made with our light and breathable Classic Canvas. All the features of the Ultimate with improved PRO materials for extreme environments and heavy use. 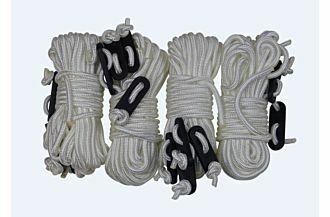 High performance PRO Canvas, extra thick rip-stop groundsheet, integrated mesh door, and burlier pegs, ropes, and poles. Our most technical bell tent series for 4 season, long term, and commercial use. PRO Canvas and groundsheet, ALL the features, PLUS a zip in-out mesh wall for 360° bug protection and ventilation. Our fire retardant series. Ultra heavy canvas with a fire extinguishing treatment, sewn in groundsheet, and fixed side walls. Less breathable than the PRO and Classic canvas. Our signature line of 100% cotton canvas bell tents. Waterproof and breathable; stylish and sustainable. For campers that never compromise. Free Shipping on All Sibley Bell Tents! Limited time offer! The timeless wind, rain, and snow shedding conical tipi shape made with our Classic Canvas and a single pole design. Storm door, rain cap, and zip in/out waterproof floor. Great for snow! Guide tent, wall tent, group tent, family tent...whatever you call them; CanvasCamp offers variety of shapes and sizes. Even my RV friends are jealous. The Sibley is a conical shaped canvas tent supported by a single center pole, making it strong, portable, spacious, and easy to pitch. The bell shape is the most heat, space, and weight efficient canvas tent design, leveraging high tensile strength with minimal structural support. Made of 100% cotton canvas, the Sibley is waterproof, breathable, sustainable, and repairable. Our flagship tent is recognized worldwide for quality craftsmanship. Accept no substitutes. Time-tested Native American design infused with modern materials and features for performance and ease of use. The steep incline of the 100% cotton canvas effectively sheds wind, snow, and rain. A single center pole, zip in/out water and vapor impenetrable groundsheet, and guy lines for extra stability make the Tipi backcountry burly and backyard convenient. Wall tents are boring. These are not those. Available in a variety of shapes and sizes, our Cabin Tents combine historically successful tent engineering with modern design and materials. Visually stunning and high performing; there’s something for everyone in this range. The most versatile and customizable event tent for any occasion. Stretchy waterproof fabric and adjustable height poles let you create different shapes and spaces. It's a high performance blanket fort for adults. The Best Party Tents. Period. Large spaces and groups are covered by this star-shaped shade suspended from a single professional grade telescoping pole. Optional walls zip in and out for added privacy or weather protection. Connect multiple Starshades and create your own event tent city!. Stylish shade and shelter for large groups, weddings, festivals, and events. Freestanding sunshades or rain shelters for lounge spaces, camp kitchens, pets, or gear. Perfect as traditional tarp shelters for 'no frills' camping. Poles optional with most models; go even lighter and use trees or trekking poles instead. Minimalist shade from the sun. 100% cotton canvas shade with grommets for secure suspension from optional poles or your own pick points. Straightforward and versatile protection from rain or sun in a variety of shapes and colors. Our portable wood burning tent stoves are ideal for moderate cold conditions, shoulder seasons, or car campers looking to save on space, weight, and money. Beautifully designed, handmade, luxury wood burning stoves. Feature packed for exceptional ease of use, efficiency, durability and heat output. Accept no substitutes for glamping rentals or use in all 4 seasons. A full selection of wood burning tent stove accessories to customize your stove set up for safe and efficient use. Stove Jacks, Heat Mats, Ovens and more. Wood burning portable stoves that provide safe and efficient heat inside any canvas tent. Vestibules, replacement parts, decorations and more accessories designed specifically for Sibley's. Compatible with most bell tents of any brand. Tent flair to make your camp your own. A selection Pegs and Stakes to secure your tent in any type of ground. The best thing we can do for the planet is to keep our gear in use longer. Extend the life of your tent with proper maintenance and DIY repairs. Explore our recommended cleaning, retreatment, and repair products. Glamping, camping with the family, or living off grid; whatever your pleasure, our selection of accessories makes it easy to customize your camp. Specially designed for high wind or hard and rocky ground, our PRO stakes are made from the same high quality nickel plated steel our poles are made from. CanvasCamp exclusive PRO guy line stakes are 24cm (9.5 inches) angled and serrated to hold up to pounding into frozen or rocky round. A T shaped hook is welded securely to the stop to prevent guy lines from slipping off even in high wind. PRO groundsheet pegs are 50% thicker than standard pegs. The pegs for the floor are round to slip through the grommets on the groundsheet, and have a hook shaped top and hold the floor in place. These are the same heavy-duty tent pegs which come with a Sibley PRO Tent. They can be used to pitch any Sibley or Sibley PRO Tent.